Thanks much...I'm going to keep plugging away at this. Any thoughts on modifying worldsize? tonawandares wrote: Any thoughts on modifying worldsize? Im pretty sure that can be tricky if you want it to be a serverside mod, but otherwise there is for example some scale settings for the map where one can change the figures, ivé done it a long time ago so cant remember exactly, but i do remember it got a bit ugly when the textures was stretched out. I might just let that thought simmer then...I'm just thinking out loud trying to resolve this pesky problem. Thanks for the reply thought, I really appreciate the help. Just not having much luck at this. Thats weird, i guess the choppers need to be set as "ObjectTemplate.setVehicleCategory VCAir" and the engines "ObjectTemplate.setEngineType c_ETPlane"
freddy wrote: Thats weird, i guess the choppers need to be set as "ObjectTemplate.setVehicleCategory VCAir" and the engines "ObjectTemplate.setEngineType c_ETPlane"
I will give this a try. Thanks so much for your help. It's pretty clear how airDensityZeroAtHeight effects wings, but the effect on engine thrust is really unclear. In fact, it looks like as you get to the height, your thrust might actually be increasing. It'd be interesting to do a helicopter takeoff test, once with airDensityZeroAtHeight at 1000.0, and another with it at 0.0.
and air density ratio is 1.0 at altitude 0, and 0.0 at altitude airDensityZeroAtHeight. When the modifier term is zero, you basically get rpm². And as you approach airDensityZeroAtHeight, this term will approach zero. Strangely, you can modify this term using noPropellerEffectAtSpeed. It looks like the intent of the term is to decrease the amount of thrust produced when your rotation vector and speed vector are aligned. It means you eventually reach some max speed. I think this term is why at high altitudes, planes start accelerating. The flight controls stop working at high altitude as well since lift stops working. This of course can lead to planes very quickly flying uncontrollably off the map. Test ran on Swaffy's Mod on map A Test Map. 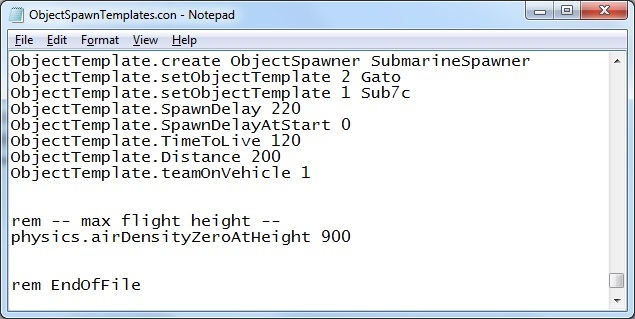 Code saved in ObjectSpawnTemplates.con under Conquest. Planes flew like normal with no change in performance in all 3 tests.